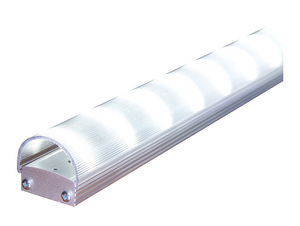 BOULDER, CO--(Marketwire - May 15, 2008) - Albeo Technologies announced today the market launch of its T8LED™ Troffer Retrofit Kit™, enabling simple conversion of existing fluorescent troffer fixtures into low-maintenance, high-efficiency LED lighting systems. Available immediately, the Retrofit Kit delivers all of the remarkable benefits of LED lighting systems to the millions of existing troffer owners. These applications include: hospitality, retail, manufacturing, cold storage, signage, display case, and office. Any person qualified to replace fluorescent ballasts can install the Retrofit Kit in minutes and never touch that fixture again. For years, fluorescent lighting consumers have been seeking solutions to their lighting problems, and many recognize that existing troffer performance can be greatly improved by conversion to LED. The troffer user is faced with two choices for making such a conversion: installing LED 'drop-in' replacement tubes that operate with the existing fluorescent ballast; or retrofitting the troffer with Albeo's easily-attached LED light bars and replacing the existing ballast with an LED-optimized transformer. Albeo's T8LED Retrofit Kit goes beyond drop-in LED fluorescent solutions to finally provide the long-term lighting solution that fluorescent consumers have been seeking. Albeo's Tracy Earles explains, "Albeo's Retrofit Kit uses patent-pending TEMPR™ Technology to efficiently pull heat away from the high power LEDs and dissipate it through the large thermal footprint of the troffer housing, enabling it to outperform drop-in replacements in terms of efficacy, light output, and reliability. While the drop-in option appears easy, it is an incomplete solution that leaves the consumer with an old ballast of unknown quality, thermally-compromised LED performance and lifetime, and a high voltage safety issue." Kits are available to retrofit existing two-, three-, and four-lamp fluorescent troffers, in 2' x 2' and 2' by 4' configurations. Two versions of the kit are available, Value and Efficacy, which minimize initial purchase cost and ongoing operating costs, respectively. Albeo Technologies will present its state-of-the-art LED lighting fixtures at booth #1971, Lightfair International, May 28 - 30 at the Las Vegas Convention Center. To schedule an interview at Lightfair, contact Sue Rose, 303-674-3459 or sue@suerosepr.com. For complete product specifications visit www.albeotech.com, or call (866) 825-5420. About this company Albeo Technologies, Inc.